All of the fighters competing in tomorrow’s “Strikeforce Challengers: Villasenor vs. Cyborg” event tipped the scales today inside the the ShoWare Center’s Club Lounge in Kent, Washington. Every participant made their required weights, including main event fighters Joey Villasenor and Evangelista “Cyborg” Santos. MMAJunkie.com reported that the Washington State Athletic Commission does not allow the standard one-pound allowance like all of the other states MMA is sanctioned in. Because of that, Strikeforce proactively included a clause in each fighter’s contract stating that the bout would automatically default to a catchweight fight if the fighter was within that one-pound gimme. 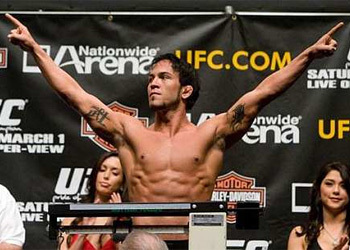 However, both Jorge Gurgel and Conor Heun agreed to a 160-pound catchweight prior to the day’s weight-ins. The Showtime event will air tomorrow at 11PM ET/PT. Here is the breakdown of all the fighters competing in tomorrow’s promotion. * – MMAjunkie.com confirmed with a WSAC official that Davis will not be penalized for not hitting the weight limit because he accepted the bout yesterday.